By 2015 the Government wants all its services to be ‘Digital by Default’. Whether it’s claiming benefits or organising our Council Tax, the only way to transact with Government locally, regionally or nationally will be online. But is everyone geared up for this and what about those who, for whatever reasons might get left behind? In a detailed review of the available evidence, aimed at improving its own services and ensuring policymakers have the full facts, Age UK has been looking at how many and what kinds of older people are offline and, by default, digitally excluded. Society Central Editor, Chris Garrington takes a look at what the report says. The topic of digital inclusion is undoubtedly a fast-changing one. There is plenty of opinion and information available, but robust research evidence is scarce and a lot harder to find and access. Evidence on the digital inclusion landscape in the UK is also subject to rapid change, and statistics can quickly become meaningless. Likewise, the characteristics of those people who are not online or “digitally excluded” are also changing, as the less resistant are starting to the use the internet. Questions asked as part of the ONS Labour Force Survey helped the Age UK researchers get some idea of how many people were using the internet. In 2012, ONS estimate that 36 per cent of single 65+ households and 69 per cent of older couples (where at least one person is aged 65+) have internet access. As far as those who people who were offline, the Age UK team added together the ONS estimates for those who had never used the internet and the lapsed users, estimating that 8.37 million adults (aged 16+, UK), of whom 6.91 million are aged 55+, with 5.59 million aged 65+ did not have access to the internet. By this measure, they say, over two thirds of all digital exclusion is among those aged 65 and over and over 82 per cent are aged 55+. When it came to trying to get a picture of the sorts of older people who are at risk of being offline, Age UK looked at a wide range of sources including the UK Household Longitudinal Study, known as Understanding Society. Its large sample of 40,000 UK homes including large numbers of older people and its rich source of information on people’s background, circumstances and attitudes, made it an ideal place to begin trying to build up a profile. Those in the older old age groups 75+ were over 5 times more likely to be offline than someone aged 55-64 or in or around retirement age, while people living alone were almost twice as likely to be offline as those who lived with another person. Being in good health was also a factor associated with being online. As far as incomes were concerned, those earning between £250 and £449 per month were 8 times more likely to be offline than someone who had a healthier monthly income of around £3000 per month. The report concludes that as well as making sure that everyone who needs to can participate in the Government’s move to provide as many services as possible online, there is now a growing body of “clear-cut evidence” on the effectiveness of internet use for alleviating social isolation in older people. These findings are potentially important not just for formulating policy and targeting appropriate services and interventions, but the detailed study of the results should help us understand what might be driving non- use of the internet at older ages. The ranking of factors in their contribution to the likelihood of using or not using the internet can also be used to compile an index of relative risk of being digitally excluded at older ages. 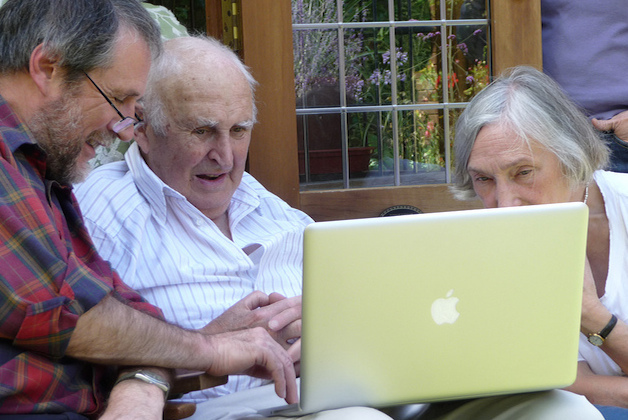 The Government’s aim by going Digital by Default may be to make its services “simpler, cleaner and faster”, as well as to save some £1.8 billion a year, but if it wants to be inclusive, then it will need to take note of the detailed evidence presented in Age UK’s report and the research being undertaken by others in this area, to ensure older people are not excluded. Service providers, including Age UK, know they will need to work hard to design and provide projects that encourage and help older people to get online and continue to try to understand what it is that makes an older person more likely to be offline.